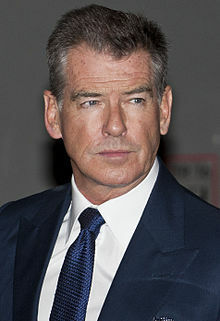 Pierce Brendan Brosnan, OBE (born 16 Mey 1953) is an Erse actor, film producer an environmentalist. ↑ Debbie McGoldrick (March 31, 2011). "Pierce Brosnan talks about his deep Catholic faith". IrishCentral.com. ↑ MI6-HQ Copyright 2014. "James Bond News :: MI6 :: Exclusive - Pierce Brosnan receives his US Citizenship - will he become the first American 007 in James Bond 21?". Mi6-hq.com. Retrieved 2014-08-26. This page wis last eeditit on 20 Apryle 2017, at 02:14.